95% of Firefighter Applicants Won't Get Past the Interview. Here's How to be in the Top 5%. 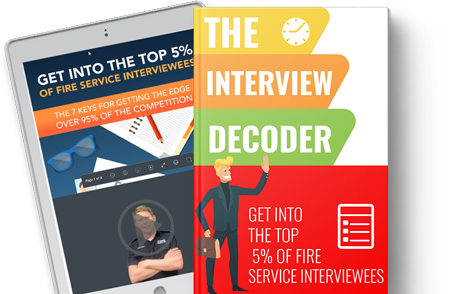 Use the Interview Decoder and get the edge over 95% of your competition. Put out the wildfires of anxiety, nervousness, and impending doom ... and know you've got this! With our 4-part formula, you’ll always have a quick, thoughtful, and complete answer ... and you'll never blow it. Add this flavor to your answers so you engage with the Interview Panel ... and make them want to choose YOU! The interview is very competitive. You’re not sure what they’re going to ask or how you’re going to answer it better than the other hundred applicants that are in for the same position. This is the part where you’re so close, but if you mess it up, you’ll be waiting at least another year on the sidelines to have another crack at it. I'm going to show you the exact areas you need to focus on in order to beat other applicants at the interview." Do you want to be Calm, Confident, and Relaxed during your interview? Use this system to be free from anxiety, to think clearly, and to articulate answers the panel wants to hear.